The heart of the Timer class. 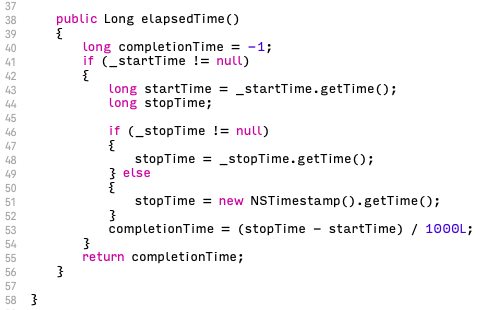 I left out a simple tip from my "Tricks I Learned At Apple: Steve Jobs Load Testing" piece about timer objects. Below, is a complete, yet simple, Timer object class I wrote shortly after leaving Apple when I was working with SMS Hayes AT commands and RESTful APIs. Timer objects do nothing more than measure the time it takes for a server's request/response loop to complete. Since this type of call is made over a network, it might finish very quickly (as expected) or, if the network is down or congested, it could take along time. If it takes a long time, the system admins will want to know. A good notification method is not to send an e-mail update or text message every single minute, or so – that ends up flooding people's inboxes. Instead, an exponential notification would be a much better idea. For example, notify the system administrators immediately, then wait one minute before the next notification, then wait two minutes, four minutes, eight minutes, etc. Finally, send a last notification once the issue's fixed. 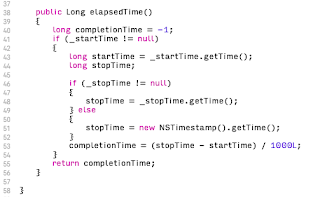 And, lastly, the complete Java timer class is anticlimactic.